Whether you're just looking for a thermostat to control your home cooling or one that would increase your savings, the Honeywell RTH7600D mode would be the perfect choice. It's designed to be easy to use and install and even if it's your first thermostat you wouldn't come across any problems as long as you follow the installation instructions. Since it's a 7 day programmable thermostat, you have the opportunity to treat each day separately and hence you would have the perfect home cooling/heating. Moreover, you wouldn't have to worry about anything as this thermostat automatically switches between heating and cooling so as to maintain a constant temperature. The display is easy to read irrespective of the lighting conditions, unlike some of the other models that Honeywell as well as other brands manufacture. Smart Technology implies Smart Cooling - This thermostat is surely amazing when it comes to cooling/heating a room. Let's say you want your room to be set at a particular temperature at around 7pm (When you return home from work). In most of the cases the thermostats would begin the cooling/heating at 7pm; however, this particular model studies your room conditions (How fast it looses heat etc.) and accordingly begins cooling/heating the room so that the room is at the designated temperature when you reach home after a tiring day at work. Easy installation - If you're familiar with the process of installing a thermostat you would be able to install it well under five minutes. However, if it's your first time you don't need to hesitate as the necessary instructions are shipped along with the box. When you buy this thermostat you would find enclosed stickers for labeling the wires, mounting screws, dry wall spacers and everything else that you're going to need. Programming is really simple - All you need to do is set your current time and then schedules. If at all you're planning the same program for multiple days, you have the option to select multiple days at a time. Once you've selected the day you would be able to choose the temperature for the different parts of the day - wake, leave, return and sleep (A normal day of work). Suits all homes - Since it's a touch screen, there are no buttons to spoil the look. Moreover, it's white and therefore suits all kinds of home interiors no matter what the color of your walls are. Daylight saving feature - There's an option wherein it automatically adjusts the entire program with respect to the daylight saving timings - hence you don't need to completely reprogram the entire system. Alert System - Whenever the filters need to be cleaned/replaced as well as when the battery is low, you're alerted. Therefore, you don't need to worry about maintenance as you're informed well in advance. 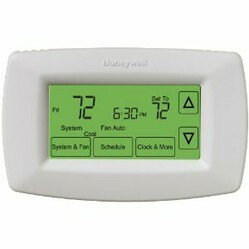 Are you happy with the features of the Honeywell RTH7600D Programmable thermostat? This model is definitely a winner and there's no reason as to why you should install it in your home. However, there are a few issues which you could easily deal with. Vacation Mode - The Honeywell RTH7600D thermostat lacks a vacation mode. However, there's an option wherein you override the program until the next schedule or the other option wherein you override it until you manually make the necessary changes. The Touch Screen - Since it's touch screen operated, there's always the possibility of the screen getting damaged. It's no different than your phone. It lasts for years without any sort of issues; but, if you're looking forward to increasing its lifetime only operate the thermostat when needed. 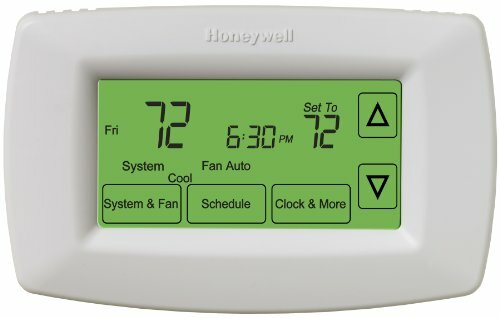 Where Can the Honeywell RTH7600D Thermostat be used? Heat pumps - whether or not they have auxiliary heat. Note: This thermostat isn't compatible with electric baseboard heat i.e. 120-240 volts. If you're not happy with this model or are just looking for a quick comparison, you'd love this Thermostat comparison table that I've come up with. That's sad :( It would make things so much easier if you still had a programmable one. I would love to have this, but my 90 year old mother is technologically challenged. I had to get rid of my previous programmable thermostat and instal one with on/off and heat/cool.